Fluffy puppy "Cash" gets some love at the Puppy Party. A dog wearing a special shawl with pockets for donations visits with event attendees. 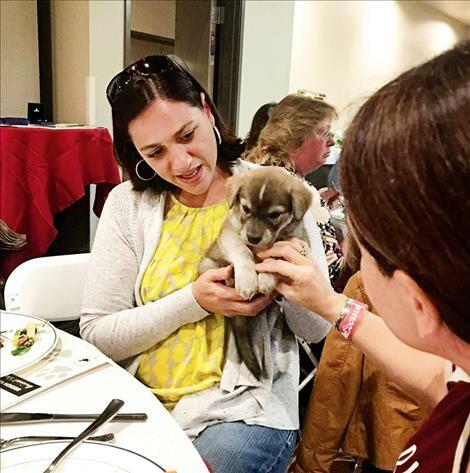 POLSON — Food, auctions, and even a fluffy puppy aptly named Cash entertained guests at the lively Mission Valley Animal Shelter fundraiser. Tickets for all 200 seats were sold for the second annual event held at the Red Lion Inn in Polson. Community members and local businesses donated items for live and silent auctions at the event. Panusz said the shelter received more donations than could be auctioned off during the event. The remaining items, including a museum-grade statue, will be auctioned off online in the coming months. Panusz estimated the event raised a gross total of over $33,000. Panusz’s goal was to raise $40,000. He said he hopes to reach close to that goal with the added funds from the online auctions. 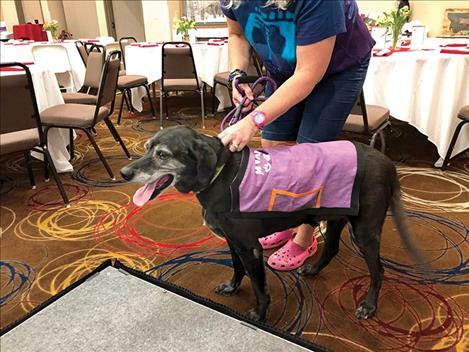 The money raised will cover normal operating expenses at the privately funded animal shelter and will also go toward efforts to expand the number of animals the shelter can serve, as the need for the shelter’s services is high. According to Panusz, the highlight of the night was the community-outreach component of the event. In addition to auctioning donated items, attendees bid to cover the costs of spaying and neutering local animals. Panusz said that he came up with the idea for a “spay-neuter match-a-thon” because he knew that some people in the community were unable to pay to have their pets spayed or neutered. Panusz explained that preventing pets from reproducing can have a large impact on an area because just one unspayed female and her offspring can produce up to 97,000 dogs over a seven-year period. Proceeds from the match-a-thon will benefit many areas of the community including average citizens, pet owners, the shelter, and the animals themselves. Pet owners who needed help having their pets spayed or neutered were found by Panusz who posted flyers, advertised in newspapers, and visited people in their homes. He then displayed photos and information about each of the dogs in need at the Puppy Party and guests bid by holding up their paddle if they were interested in sponsoring that dog’s operation. Those who sponsored a dog were given a thank you note written by the dog’s owner. Nineteen dogs were sponsored at the event. Panusz said he was pleasantly surprised at the level of enthusiasm he saw for the match-a-thon. “It’s very fulfilling to know that you’re really helping,” he said. Panusz’s search for dogs that needed to be spayed or neutered enhanced the event in another way, too. Panusz met Cash, the fluffy puppy attending the Puppy Party, because Cash’s mom needed to be spayed and ended up being one of the dogs sponsored at the event. Overall, Panusz said the event was very positive. “It’s extremely fulfilling for us after all the work we put into it, and it was fulfilling for the people who participated too,” he said.